Okay everyone, settle down. 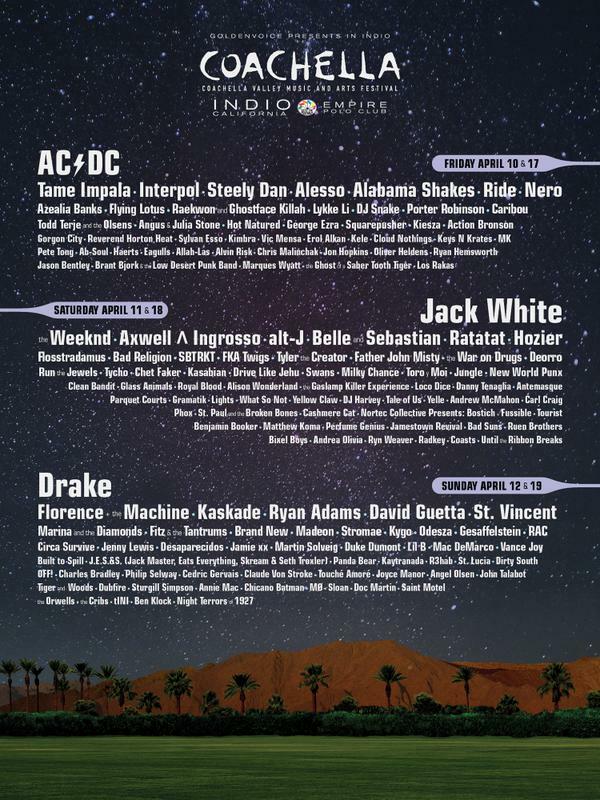 Ready to share my much anticipated response to the Coachella 2015 lineup, which dropped three hours ago. Sorry it took so long. These first world problems of mine just stack UP sometimes, hoo boy. Boo, in a word. Or if that's too harsh, meh. I've seen Jack White. AC/DC? *makes jerkoff motion* Zero interest in Drake. And Coachella is just too damn expensive to not love at least one headliner. Most of the top and middle tier acts I've either seen already or passed on watching at a previous festival. The rest I'm either not into or ambivalent about. There are a few bands/producers out there that I would pay to see again and again...but none of them are on that lineup. I'm sure there's tons of talent in the lower tiers that I'm just unfamiliar with, but that's not enough of a reason to go. Three draws: Ryan Adams, Angus Stone, and Hozier. That's it. Two of whom come through LA every couple of years or so. Not worth it, when there are a dozen other festivals and plenty of years ahead, anyway. So I guess thanks, Coachella? For saving me some cash? Maybe I'll see you in '16? In the meantime: your move, Bonnaroo.